SF writer Gary Gibson: Thirty Years of Rain, Elements of Time, and a new story. 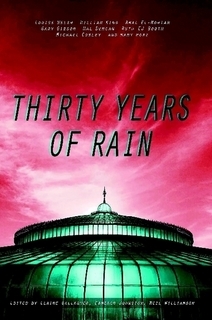 Thirty Years of Rain, Elements of Time, and a new story. As is often the case when I'm close to finishing a manuscript, certain things worthy of my attention get passed over, or are blogged about later than I intended. 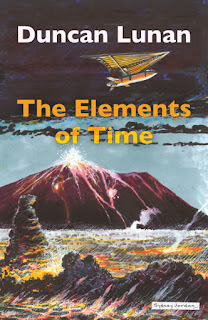 So let's fix that with mention of two new books that just came out, and which I have some connection with: Duncan Lunan's Elements of Time, and the anthology Thirty Years of Rain, which collects stories by numerous authors who have attended the Glasgow Science Fiction Writer's Circle over the last three decades. A few years back I carried out an experiment called Brain in a Jar Books, having realised I knew numerous authors who had work languishing unseen on their hard drives. Often these works had been previously published in some professional capacity, but not in ebook form. I chose to put a number of these out on Kindle to see if anyone noticed and bought them with minimal - and by minimal, I mean zero - advertising. The experiment was variable in its success, and had unexpected consequences. In most cases, the books sold very little, despite at times having a considerable pedigree behind them or receiving a few (a very few) rhapsodic reviews. I wanted to see if such books would sink or swim if thrown bodily into the proverbial ocean of ebooks, or if their inherent quality, having in some cases been nominated for awards or even won awards, would allow them to swim. Unfortunately, almost to a man, they sank. There are endless accounts regarding the golden opportunities afforded writers by self-publishing on Amazon, but my own experience as a publisher didn't appear to bear that out at all. Maybe it's the covers of the books. Maybe it's something else: I'm not quite expert enough to say. However, for some reason the name Brain in a Jar Books became a force in and of itself: people knew I had something to do with it, and it seemed to get a lot of attention...without anyone actually buying the bloody books. I saw my name and Brain in a Jar mentioned in some of the bigger media-oriented sf magazines, and was startled to find that Brain in a Jar formed part of an exhibition in the National Library of Scotland. Again, none of this translated into sales. But it appeared to be wonderful advertising from me, which I hadn't expected. Anyway, one of those books was a collection of time travel stories by Duncan Lunan, several of which had first appeared as cover stories in Asimovs, and at least one or two of which were nominated for a Nebula. You'd think that would be worth a punt of a quid or two, wouldn't you? Apparently not. Fortunately, the collection has now been taken over and republished and even put out in a printed edition by the people behind Shoreline of Infinity, the magazine that published my recent story 'Senseless'. It had a small launch just the last week, and you can buy it now. It's called Elements of Time. I also have a story called The Ranch in Thirty Years of Rain, the aforementioned writer's anthology, which comes both in a print edition and a pleasantly light on the pocket e-edition. This also had a launch - twice - first at a convention, and then at the Glasgow Waterstones. Other authors featured in the anthology include William King of Warhammer fame, Louise Welsh the crime writer (and whom I never realised had attended the group at any point), Hal Duncan, Neil Williamson, Mike Cobley and so on, and so forth. Here's the Amazon link.